You’ve probably heard it from us before, but it’s worth repeating: Without a doubt, the most critical step in your skincare routine is applying sunscreen, rain or shine, 365 days a year. 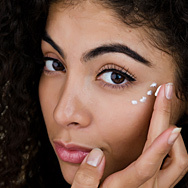 Daily use of sunscreen, along with other sun protection measures (like sunglasses, sun hats, and SPF-rated clothing), defends your skin not only against early signs of aging (like fine lines, uneven skin tone, skin discoloration, sagging, and loss of radiance), but also against skin cancer. It’s a multitasking step you simply can’t skip. If you have dry skin, you might feel as though your only sunscreen options are either chalky and powdery, or emollient to the point of being greasy and slippery. Worry not: There are sunscreens that fit right into that happy medium you’ve been trying to find. ALWAYS choose broad-spectrum formulas rated SPF 30 or greater. Broad spectrum means that a sunscreen protects against both UVA and UVB rays, which is important because they cause different kinds of sun damage. You might see products with less than an SPF 30 rating, but health experts and medical boards around the world agree that SPF 30 or greater is necessary when it comes to providing a reliable defense against the sun’s rays. Your sunscreen should be loaded with additional beneficial ingredients. The SPF rating is very important, but the best sunscreens also come packed with other ingredients to boost their anti-aging potential. We’re talking about potent and effective antioxidants as well as ingredients that calm redness to help your skin look beautiful and healthy. Pick a luxurious sunscreen with all the benefits of a great anti-aging moisturizer. Your sunscreen should also contain nourishing emollients, like non-fragrant plant oils and fruit butters to moisturize and protect skin, as well as skin-restoring ingredients, such as ceramides and peptides, that add suppleness and reduce the appearance of wrinkles. Choose a sunscreen that’s gentle to your skin. When we say gentle, we mean free of irritating ingredients, including fragrance (whether synthetic or natural, fragrance is always a problem), alcohol, citrus oils, and other plant extracts that can sensitize skin and make it feel drier and look redder. At Paula’s Choice Skincare, we pride ourselves on providing top-notch sunscreen options for every skin type. All of the sunscreens listed below meet the above criteria for those with dry to very dry skin. RESIST Skin Restoring Moisturizer with SPF 50—This dual-functioning hydrating daily moisturizer with SPF 50 helps improve the appearance of existing damage and helps prevent future premature skin aging, with a dewy finish that brightens dull skin. SKIN RECOVERY Daily Moisturizing Lotion SPF 30—This creamy sunscreen has skin-replenishing ingredients that hydrate parched skin and a potent mix of antioxidants that help visibly smooth the appearance of fine lines and wrinkles. CALM Redness Relief SPF 30 Mineral Moisturizer for Normal to Dry Skin—This mineral-only sunscreen formula treats flaky, reddened skin to rich skin-replenishing emollients, and is extraordinarily gentle for the most sensitive skin, even for those with skin prone to rosacea. MOISTURE BOOST Daily Restoring Complex SPF 30— A richly moisturizing yet lightweight sunscreen that hydrates, plumps, and works beautifully under makeup.